Is it adventure you seek? Then look no further; Peleliu Express can be a thrilling ride past beautiful corals teeming with schools of tropical fish. These converging currents come to meet the reef after a long time of gathering momentum from the open ocean. With this convergence, they bring in all types of large pelagics. Peleliu Express is situated on the southern reef of Peleliu Island where the open ocean currents come together at the southern tip of the archipelago. But most of all, the plateau wall is littered with beautiful corals of the soft and hard varieties, and bustling all about them are the many different schools of tropical fish commonly found throughout Palau. Anemonefish of all kinds are seen hiding amongst their anemone homes. Angelfish, butterflyfish, anthias and even schools of the ever-popular oriental sweetlips are scoring amidst the plateau. It is not uncommon to see large schools of tuna, barracuda, surgeonfish and large Rainbow Runners and even spot a unicornfish cleaning station or two. A bit more rare, but not altogether unheard of are sightings of whale sharks, hammerheads, marlins, sperm whales, pilot whales and orcas. Hooking in on the reef provides divers with ample photo opportunities of giant groupers, rays, turtles and Napolean wrasse gliding close by. Combine the teeming marine life with a thrill ride in the currents and some divers say this is the best dive spot in all the World. Post by Wild about Palau. 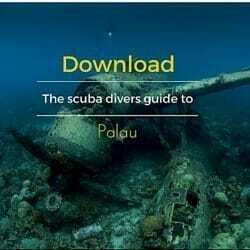 Peleliu Express is not suited for all divers. The ripping currents are unpredictable and often change without advanced warning. The experienced diver can experience over 4 knot currents on a regular basis. Divers are required to carry their safety sausage and are recommended to stay close to their dive guide and the group. Peleliu Express is aptly named for the effects of the incoming tides flowing to the northeast and the outgoing tides flowing to the southwest around the plateau. The reef is a vertical wall, running parallel on the eastern side of Peleliu Island. Near the southern end of the wall is a large rock at 45 feet marking the end of Peleliu Express and the beginning of Peleliu Corner. On the plateau, at approximately 45 to 60 feet divers can hook in on a rock and watch all the action around the Corner. It is advised only to go all the way to Peleliu Corner during the proper currents otherwise the possibility for down currents do exist. At the beginning of the dive, divers will drop in front of the sandy lagoon just east of a historical Land Japanese WWII monument. Quickly dropping down to 20-35 feet on top of the reef and then over the edge of the reef, following the wall to 75-85 feet with the wall on your right. Ascend again to 45-60 feet on the plateau near the Corner and kick back and watch the action. Would you like to scuba dive Peleliu Express with us? Click here to contact us directly if you would have any questions or would like to book a scuba dive package with us.